Justice Saliu Saidu of the Federal High Court in Lagos will on December 4 hear the preliminary objection filed by the Central Bank of Nigeria (CBN) against a suit filed by MTN Nigeria Communications Limited challenging the $8,134,312,397.63 fine imposed on it by the apex bank over alleged forex remittances infractions. Justice Saidu adjourned the case after counsels to the parties, Chief Wole Olanipekun (SAN), who led a team of 15 counsels comprising 5 other SANs and ten other lawyers for MTN, and, Seyi Sowemimo (SAN) and Ademola Akerele (SAN) for CBN agreed to argue the preliminary objection and all other pending applications on the agreed date. The judge also ordered that a hearing notice should be served on the Attorney General of the Federation, Abubakar Malami (SAN), who was joined as the 2nd defendant in the suit but was absent in court. In the suit, marked FHC/L/CS/1475/2018, MTN is seeking a court declaration that it's not liable to pay the sum $8,134,312,397.63 demanded as penalty from it by the defendants vide his letter of 3rd September,2018. While the apex bank in its statement of defence and counter-claim, has urged the judge to dismiss MTN's suit, insisting that the telecommunications giant must refund $8.1bn to the federal government. MTN, in its suit, is also seeking an order of injunction restraining the defendants ,their agents whatsoever acting on their authority from giving effect to the decisions,demands and directive contained in the letters of August 28,and september, issued by the defendants. The telecommunications company is further praying the court to declare that "the 1st defendant's decision in its letter of August 28, 2018 with Ref No GBD/GOV/COM/DGF/118/121 addressed to the plaintiff and titled: 'Investigation into the remittance of foreign exchange on the basis of the illegal capital importation certificates issued to MTN Nigeria Communications Limited' were reached in breach of the plaintiff's right to fair hearing." MTN urged Justice Saidu to hold that the CBN "lacks the power to determine the civil obligations or penal liabilities of the plaintiff." It is urging the court to the declare that the CBN acted ultra vires its statutory powers when it wrote the August 18 letter to it demanding a refund of $8.1bn. The firm wants the court to hold that the $8.1bn demand was "illegal, oppressive, abusive, unauthorised and unconstitutional. 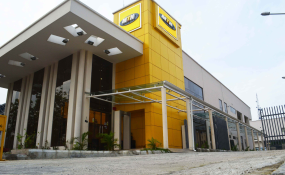 In a statement of claim jointly filed before the court by Chief Wole Olanipekun and four other Senior Advocates of Nigeria, MTN states that between 2001and 2006 its shareholders invested the total sum of $402,590,261.03 into it to meet the various obligations ,including statutory payments to the government of Nigeria which was confirmed by the CBN. According to the firm, the investment were issued by authorized dealers who are Standard Chartered bank, Diamond bank and Citibank,the CCI were converted into equity and preferential shares, as the article of the association allows it to alter its share capital. It stated, however, that by a letter signed by the Governor of Central Bank,CBN communicated a decision to MTN through the Managing Director of Stanbic Chartered bank limited whereby it decided amongst others, against the plaintiff, that "the action of your company and the banks represent a flagrant violation of the extant laws and regulation of the Federal Republic of Nigeria on foreign exchange matters. "The sum of $8.1bn illegally repatriated by MTN on the basis of illegal issuing of CCIs should be refunded to the coffers of the central bank of Nigeria with immediate effect". MTN posits that the CBN lacks power to make a finding of illegality and it also has no power to penalise the plaintiff on the basis of alleged illegality. But the Apex bank averred, in its preliminary objection, that MTN Nigeria communication limited deliberately withheld information on What proportion of the sum of $402,590,261,03 was imported into the Federal Republic of Nigeria as Shareholders loan and was equity. CBN said in the course of its supervision of the foreign exchange market, an issue of foreign exchange with irregular CERTIFICATE OF CAPITAL IMPORTATION (CCI) arose in respect of certain foreign exchange transactions carried out by Standard Chartered bank Limited, Stanbic IBTC bank limited, Citi bank Nigeria limited and Diamond bank Plc collectively referred to as "the bank.s". "CBN carried out a special investigation of the said transactions and it came to light that the banks had at the material time between 2007 and 2015 used irregular CCI to remit foreign exchange amounting to $8 134,312,397.63 on behalf of MTN Communications Limited and for the benefit of its shareholders. "CBN met the banks and MTN's representatives on 25th May,2018 on the issue and they each made copious representation to CBN. Upon consideration of all the relevant issues including MTN and the banks' representations CBN demanded immediate refund of the foreign currenci es repatriated to its account. "Standard Chartered bank limited, one of the bank involved in the irregular transactions admitted in writing that it repatriated foreign exchange for MTN without obtaining a final approval from CBN, it further stated that its action was an unintentional omission which its regretted, and MTN conceded this in its statement of claim. CBN intended to rely on the Standard Chartered bank limited at the tria of this suit. "CBN averred further that contrary to the statement of claim of MTN, it was condition precedent to obtain the CBN's final approval before foreign exchange currency can be repatriated in the circumstances and MTN and the banks are aware of this condition. "CBN contended that MTN would not make a similar claim of right as is being made in this suit in the United States Of America, in the United kingdom, the Republic of South Africa or other countries of the world. "MTN did not comply with the conditions attached to the CBN approval in principle, as MTN refused to provide an undertaking that no remittance for both interest and principal would be made on loan to its shareholders from the date of the loan to the date of its conversion into preference shares. "CBN averred that the names of the banks are cleverly omitted by MTN from this suit. "The CBN did not deny that the plaintiff has a right to alter its share capital structure, but when such alteration has a corresponding effect of CCI from shareholders loan to equity, its approval became necessary. "The action of the banks and the circumstances of MTN leads to the inference that the foreign investment transaction may have been premeditated and contrive as a scam to make maximise profits, defraud the Federal Republic of Nigeria and to enjoy unlimited foreign exchange laws and regulation". The apex bank said MTN's banks failed to verify that the telecom group had met all the country's foreign exchange regulations.